With its amazing theme and shivery unpredictability, the Hollywood Tower of Terror is one of the most popular thrill rides at both Disney's California Adventure theme park and Florida's MGM Studios. But what makes this ride so special that it has generated fan clubs and cult followings? The ride's official name is the Twilight Zone Tower of Terror, which gives prospective riders an instant clue about its ominous theme. Each park has its own variation of the thrill ride, though the installation at MGM Studios in Orlando was the first constructed. Additional rides can also be found in the Paris and Tokyo Disney parks. Today, each version of the ride has subtle differences, but no matter which Hollywood Hotel guests check into, they are sure to check out superb theming and awesome thrills. The Tower of Terror is a spooky recreation of the Hollywood Hotel, circa 1939. Legend says that on October 31, 1939, five passengers boarded the elevator in that posh hotel but the elevator shaft was struck by lightning, opening a rift and transporting them to the Twilight Zone. The theme park rides recreate that vintage horror with amazing clarity, from the lightning scorch marks on the ride's exterior to the authentic props from different Twilight Zone television show episodes found throughout the staging and preparation areas of the ride. Guests are guided through the introductory lobby and library by ride hosts costumed in 1930s bellhop uniforms as they learn the story of the elevator accident. The eerie narration is delivered in true Twilight Zone style, and the tour ends in the boiler room, where guests board the elevator for their own journey to the Fifth Dimension. 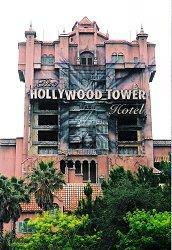 Even as the elevator rises, guests are treated to additional effects - the sounds of thunder and wind to replicate the storm conditions, breaking glass, echoes, and glimpses of the hotel's interior hallways, including a floating window, fading stars, and in the California ride, the ominous vision of the guests' own images distorted into ghostly silhouettes by a thermal imaging mirror. Walt Disney Imagineers were able to recreate the mood and setting of the Twilight Zone by watching all of the show's more than 150 episodes at least twice to pick up the nuances that make this ride's theme so convincing. The intricate theme of the Hollywood Tower of Terror sets the stage for the true thrill, however, the unpredictable drop of the elevator as the "accident" occurs. The Twilight Zone Tower of Terror ride is a complex thrill ride based in a freefall elevator shaft, but to make the ride even more spectacular, special adjustments are made to the experience. The drop sequence is randomized by elaborate computer programming in the Florida tower, making each ride a unique adventure. In each ride location, the doors of the elevator briefly open to give guests a glimpse of the park from a threatening height at the top of the tower, while the drop itself is in relative darkness. The Florida ride reaches nearly 200 feet high, while the California version is almost 20 feet shorter, though each one offers multiple drops for an incomparable thrill. To accentuate the illusion of the ride, freefall isn't the only force used to simulate the drop. Each tower is equipped with sophisticated motors that propel the ride cars faster than gravity would pull them, creating a sense of greater height and more terror than freefall alone could do. With both United States versions of the Tower of Terror offering unique experiences, many guests wonder which park to visit for the best thrill ride. In truth, both rides are extremely comparable and the effects only offer minor variations. The overall experience at both locations is a nearly five minute adventure through the preshow areas and the ride itself, though the California tower ride is slightly shorter. The Florida ride first opened in 1994, while the California tower followed in 2004 and incorporates slightly more advanced technology. The Florida ride has been regularly updated, however, and is thrilling guests just as well as the day it first opened. The Twilight Zone Tower of Terror is not for everyone. Very young passengers may become too scared by the convincing theme, and if they decide to bypass the ride, they can leave the staging area discreetly without winding back through the show area. Because of the sudden drops during the freefall, guests with heart, back, neck, or blood pressure problems should not ride, and the attraction is not recommended for pregnant women. All guests must be at least 40 inches tall to ride. Because of the cult popularity of this attraction, the wait is regularly longer than 60 minutes. The Disney Fastpass is available for ride reservations, however, and lines are typically shorter early and late in the day. Because the ride is indoors and air conditioned, it is most popular when the heat of the day is in full force. The Hollywood Tower of Terror is a signature attraction at the Disney theme parks, giving riders the double thrill of a superb freefall ride coupled with exquisite theming that does indeed take them to the Fifth Dimension.